Stylish people outside the venue, waiting anxiously to see the Dimitris Petrou AW2010/11 presentation last night in downtown Athens. And more stylish people inside, partying after the show! 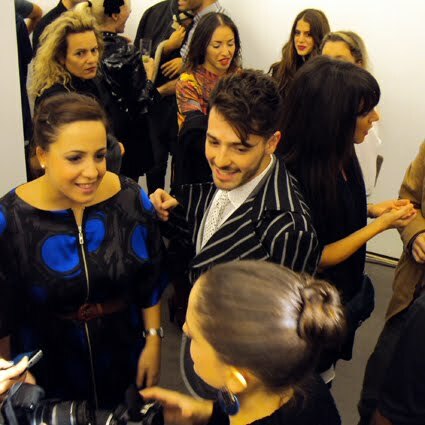 Christiana of Fashion Paths, Alex from MTV, Elena's ballerina bun in front of them and Miss Athènes in the background. What's a blogger without a fancy camera, right? Gotta get myself one pronto. 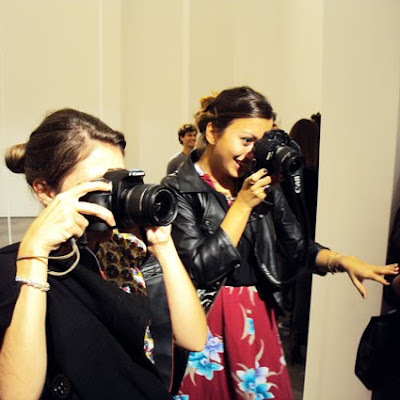 In the meantime, watch out for the lens of Alecca Rox - incognito as always - and Thalia of Life in Athens. As usual, I totally forgot to hand over my camera to someone else, so I borrowed this lovely group shot from Alecca Rox's post. 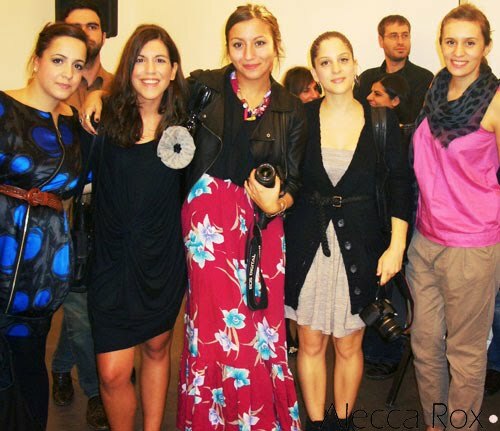 Christiana, Haritini, Thalia, Elena and yours truly, reporting from Dimitris Petrou AW2010/11 show for you! The post on the actual show will be up later today. my oh my! i'm so busted:P i'll be fair and confess the weapon in my hands belongs to sweet lfof. so much fun re-living the atmosphere through your post, and of course it's ok to borrow that snap, especially as u referenced it so nicely! gorgeous as always, i got another one of u coming up so worry not, you're on record. Apart from this we look stunning & united together! Anyway, I love the fashion and then food, new habit of ours!!! It's so nice to view all of us together indeed!!! These days I'm almost forgetting to capture our pics as well!! thank god there's Alecca!!! I'm envying that zipper dress with the blue-on-black pattern--too cute.